Ripping Yarns: Denton & Cook - Tomorrow's World 7"
TW Looks To The 80's: An Illustrated Guide. 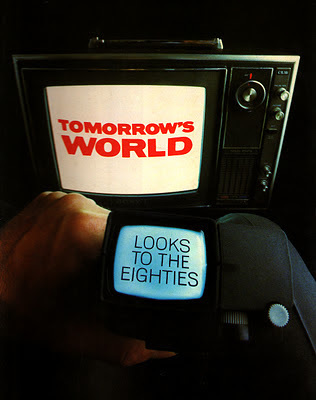 Richard Denton & Martin Cook - Tomorrow's World b/w Inside Story (1980). The sound of your future yesterday. An early electro/space disco masterpiece. The b-side could not be more different, a lovely reflective pastoral piece for flute and acoustic guitar, akin to the music often used to introduce Programmes for Schools and Colleges around that time. Have a listen to this and see what sample you can spot running throughout it....! Brilliantly done by a young British producer with a feel for the 80's. Ah yes! Liking that a lot.